Explain the ways in which R.C. 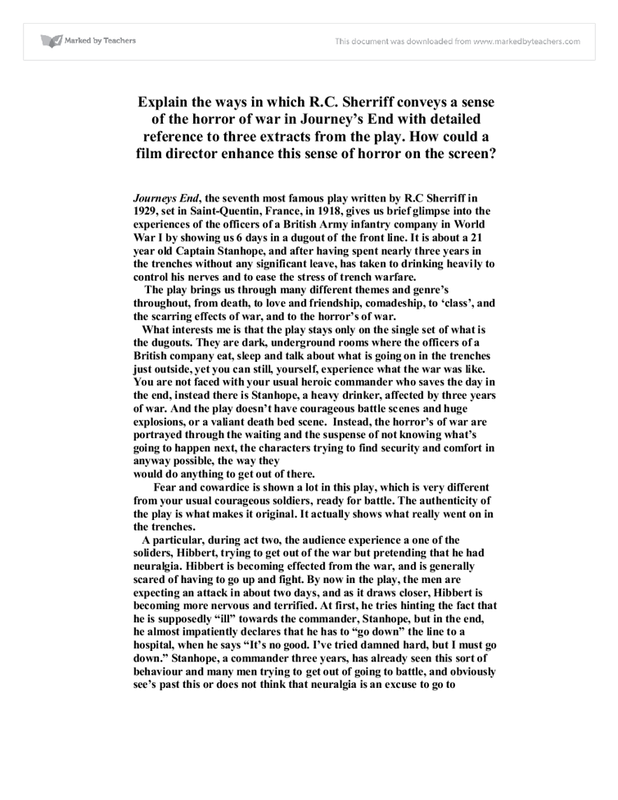 Sherriff conveys a sense of the horror of war in Journey's End with detailed reference to three extracts from the play. How could a film director enhance this sense of horror on the screen? 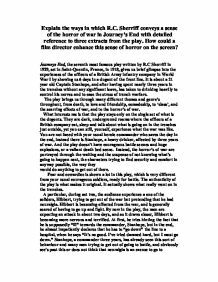 Journeys End, the seventh most famous play written by R.C Sherriff in 1929, set in Saint-Quentin, France, in 1918, gives us brief glimpse into the experiences of the officers of a British Army infantry company in World War I by showing us 6 days in a dugout of the front line. It is about a 21 year old Captain Stanhope, and after having spent nearly three years in the trenches without any significant leave, has taken to drinking heavily to control his nerves and to ease the stress of trench warfare. The play brings us through many different themes and genre's throughout, from death, to love and friendship, comadeship, to 'class', and the scarring effects of war, and to the horror's of war. would do anything to get out of there. Fear and cowardice is shown a lot in this play, which is very different from your usual courageous soldiers, ready for battle. The authenticity of the play is what makes it original. It actually shows what really went on in the trenches. A particular, during act two, the audience experience a one of the soliders, Hibbert, trying to get out of the war but pretending that he had neuralgia. Hibbert is becoming effected from the war, and is generally scared of having to go up and fight. By now in the play, the men are expecting an attack in about two days, and as it draws closer, Hibbert is becoming more nervous and terrified. At first, he tries hinting the fact that he is supposedly "ill" towards the commander, Stanhope, but in the end, he almost impatiently declares that he has to "go down" the line to a hospital, when he says "It's no good. I've tried damned hard, but I must go down." Stanhope, a commander three years, has already seen this sort of behaviour and many men trying to get out of going to battle, and obviously see's past this or does not think that neuralgia is an excuse to go to hospital. The scene goes on to the point where Stanhope and Hibbert get into a struggling fight, where Hibbert asks Stanhope to shoot him. This shows the horror's of war because the character Hibbert is desperate to get out and go home because he knows that the attack is near. It's not the actual war and the actual battle that is particularly horrifying, but having to wait for it, knowing that it's going to happen, and being not completely one hundred percent sure that you're going to come out alive is what is haunting Hibbert. The director could develop the horror of this scene on the screen by making the sounds of the distant guns and explosions a bit more taunting, almost as if Hibbert is getting more and more scared as the attack comes closer. Hibbert should also be shorter than Stanhope because Stanhope is more of an intimidating figure who is in charge, whilst Hibbert is a cowering soldier trying to get home. The actor playing Hibbert shout also be stuttering, not sure what to say or do because Stanhope is telling him that "No man's sent down unless he's very ill. There's nothing wrong with you." Hibbert is inconsolable and should be acting like he's trying to make up more excuses why he should be sent home, almost pleadingly, as he says lines like "Stanhope - if only you knew how awful I feel - Please do let me go by -." Hibbert gets very distressed and says things like "What the hell-!" and Stanhope and him get into a fight. Stanhope should be stronger and more skilled than Hibbert as he is trying to get away and disobey him, so the thrusting and the struggles from Hibbert should be pathetic and weak, quivering, and Stanhope should be firm and almost unfazed. The whole point of this scene is having to face reality and not really believing what you waited for, for so long, and feared was going to finally happen. The lighting should be dark and there should be shadows on Hibbert's face, showing how distraught he is and possibly the lack of sleep. There should be a lot of close up shots as well to see character reactions, and some long shots to show the character's difference and maybe, their similarity, how they are both afraid but are reacting but are handling it in different ways. A lot in the play, we see a lot of how the men cope with the dread of being in the war, and the upcoming attacks. The constant talk of food whenever the topic of attacks and the war comes into the conversation, Stanhope's drinking problems, and pretending they have illnesses so they could have a shot at trying to go home. Osborne is seen as an "uncle" figure between the officers for his avuncular manner, and at one point in the play, Osborne is reading an extract from Lewis Carroll's Alice in Wonderland. Raleigh questions him on why he is reading a children's book which doesn't make sense, but it seems that Osborne is comforting himself by going back to times where he was safe and secure in his childhood memories. Before Osborne reads the extract from Alice In Wonderland, Raleigh and him were talking about the raid, possibly lots of dramatic pauses, trying to avoid eye contact, when Osborne quickly changes the subject and reads more of Alice In Wonderland, leading them into a completely different conversation about Raleigh's home town. This scene should be acted as if Osborne is showing his first vulnerability in the play, taking comfort in his childhood memories, when he was away from the war, and in a safe and secure environment. When Raleigh comes over, he tries to adopt his fatherly figure. Raleigh is still very new to all this, so he is very naïve and almost acts as if he is looking forward to this raid. The actors should say the lines from Alice In Wonderland as if they were haunting and not comforting at all. Osborne and Raleigh should be quite awkward and trying to avoid eye contact, sadly contemplating what they miss. Another horror of war portrayed in this play is the lack of certain possessions and things that the men cannot have whilst in the dug out. It being good food, comfort, sleep and even women. Throughout the play, the men are constantly referring back to food or their lives back home, and at one point, looking at pictures of naked women together. In the war, the men are deprived from these things. The deaths of two of the most important characters in the play Osborne, the paternal figure, and Raleigh, the figure of innocence and naivety are extremely important, as are their effects on Stanhope and are another horror of war. When Raleigh is dying from a shell hitting his back, he is paralysed, and is with Stanhope in his dying moments. Stanhope, who, from his drinking and paranoia, had always been very distant and cold towards Raleigh because he thought that he could write home to his sister about how much of a wreck he was, was now showing a new and comforting side of himself, calling Raleigh "Jimmy" and "old boy." Even now, Raleigh is naïve, thinking that there is something on his legs as he cannot move them, saying that he is "feeling rotten, lying down here when everyone else is up there." By now, Stanhope would be desperately trying to comfort Raleigh, hoping that he would get lucky and possibly survive his injury, but through this scene you can tell that Raleigh's voice is getting even more distant and softer as he is slowly getting weaker. The lighting should be soft and with some shadows to represent Raleigh's fading life and the sound of the raid should still be going on. When Raleigh dies, Stanhope is left alone to face the rest of the war on his own, another revulsion of war. In the wars, Robert Rose is a very significant character. Some people fake illness to avoid having to put up with the horrors of trench life so that they will be sent home like Hibbert who is claiming to have bad neuralgia in his eye, "It seems to be right inside this eye. The beastly pain gets worse every day."